Study and travel courses build a well-rounded college experience. Traveling opens the senses, keeps the mind sharp, enhances creativity and shifts perspectives. With this in mind, the Honors College develops a number of study and travel courses each year. These courses are designed to enhance the holistic academic experience the Honors College provides. The Honors College Study and Travel courses are slightly different than a typical study abroad program. Students spend a semester in class prior to the trip in order to fully immerse themselves into the history and the culture of the location. At the end of the semester participants pack their bags, and their new-found knowledge, on a week-long trip to experience first-hand what they have spent the past few weeks studying. This method allows for a more in-depth understanding of the location, and an easy transition into different cultures. 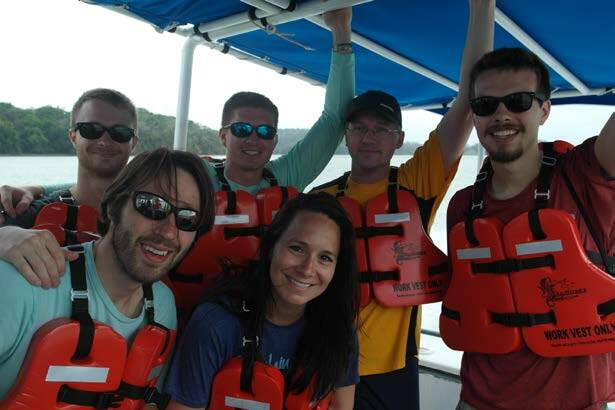 The Honors College has a variety of study and travel courses to experience and enjoy. 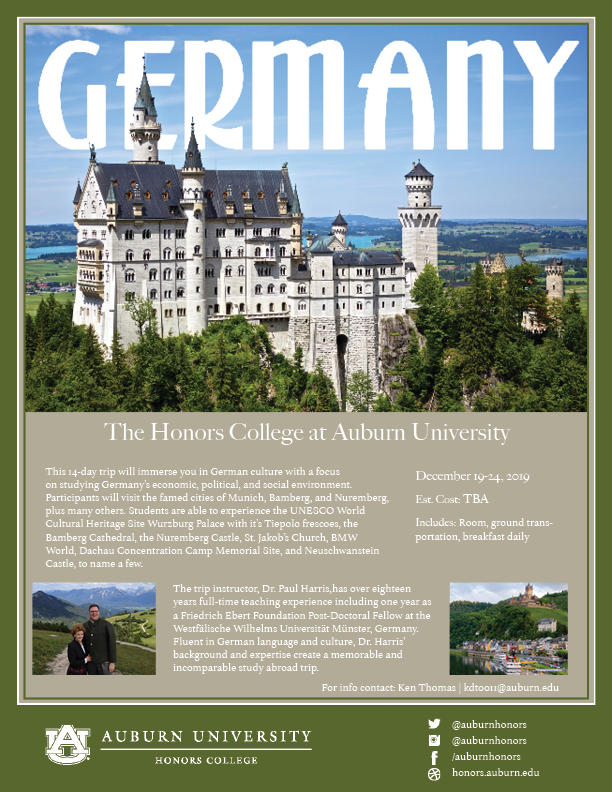 The staff works closely with the Auburn Abroad to help participants understand the requirements and costs for studying abroad. "Spending my winter break in Greece and Turkey this past year was one of the top experiences I have had as an Auburn Student. Being able to get away for a couple of weeks between semesters and immerse myself in such different and unique cultures made for an incredible trip. From start to finish the trip was well planned, allowing us to have a great time while learning so much. My favorite part of the two week experience was how we learned about a very wide range of history. From ancient Greece and the Parthenon to the Byzantine Empire and on to the Ottoman Empire, with a few medieval castles here and there, we were able to see how Greece and Turkey progressed through history. Overall, I loved the whole experience and would recommend the trip to anybody. I had an absolute blast seeing, eating, and experiencing all of the unique things Greece and Turkey have to offer." "Traveling to Greece and Turkey was not only the first time I've ever traveled out of the United States but it was also the most I have ever grown as an individual in such a short span of time. Through exploring such historic and beautiful cities first hand, meeting interesting people, and getting lost (over and over again!) my world view expanded drastically and I feel almost a profound enlightenment from the experience. This winter was truly a life changing one and eager is an understatement of my excitement to be able to travel abroad again!" These experiences will not only help you grow as individuals, but will also expose you to new and unparalleled opportunities. Please feel free to contact our office to learn more about possible scholarship opportunities. Travel the cobble-stoned streets of Old Havana to the rich farmlands of tobacco country and the architectural gems of the island's central provinces. Along our route, we will stay with local families, visit schools and medical facilities, cook Cuban cuisine, spend the day on a farm, dance salsa, walk in Hemingway's footsteps, and engage with leaders in the fields of history, politics, economics, and the arts, to name but a few activities. Read last year's student blog. 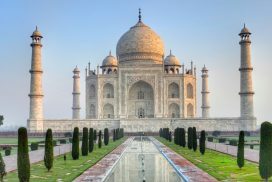 This unique opportunity will allow you to see and experience the beauty and allure of both historical and modern India. The course will focus on current sociological issues in India such as population, the environment, culture and everyday life. Participants will gain an appreciation of Indian food, music, dress, Bollywood films, and much more. Study and explore Germany's economic, political, and social environment while visiting the famed cities of Munich, Mainz, Dresden, and Nuremberg. 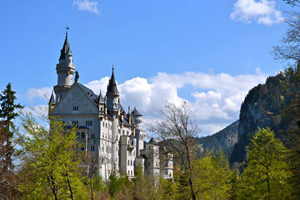 Experience the UNESCO World Cultural Heritage Site Wurzburg Palace with it's Tiepolo frescoes, the Bamberg Cathedral, the Nuremberg Castle, St. Jakob's Church, BMW World, Dachau Concentration Camp Memorial Site, and Neuschwanstein Castle as part of your Germany Study & Travel course. Tour the "Big Apple" through the world of theatre. Attend Broadway, off-Broadway, and off-off-Broadway productions. Take a behind-the-scenes tour of a theatre and enjoy the iconic NYC sites, shopping, and street food. This unique opportunity will allow you to see and experience the beauty and allure of both historical and modern India. 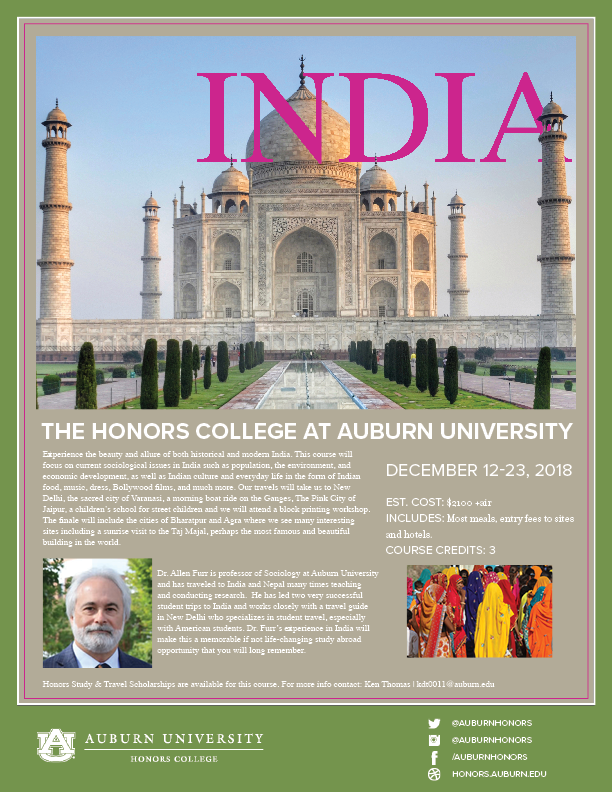 The course will focus on current sociological issues in India such as population, the environment, and economic development, but students will also learn about Indian culture and everyday life. Participants will gain an appreciation of Indian food, music, dress, Bollywood films, and much more. The class will first travel to New Delhi where they will visit a number of famous historical sites such as Gandhi’s ashram, and then to the sacred city of Varanasi, where participants will take a morning boat ride on the Ganges. From there the class flies to Jaipur also known as The Pink City, to experience its markets and history. As well as a visit to a children’s school for street children and attend a block printing workshop. From there they’re off to Bharatpur and Agra to see many interesting sites including the grand finale – a sunrise visit to the Taj Majal, perhaps the most famous and beautiful building in the world. Study and explore Germany's economic, political, and social environment while visiting the famed cities of Munich, Mainz, Dresden and Nuremberg. Experience the UNESCO World Cultural Heritage Site Wurzburg Palace with it's Tiepolo frescoes, the Bamberg Cathedral, the Nuremberg Castle, St. Jakob's Church, BMW World, Dachau Concentration Camp Memorial Site, and Neuschwanstein Castle as part of your Germany Study & Travel course. On this 10-day study abroad program in Greece, students will split their time between the bustling city and the mountainous countryside. In Greece, students will visit the famous site of the oracle of Apollo at Delphi and explore the mountaintop monasteries at Meteora. Participants will also enjoy the spectacular geography, taste local cuisine, and visit artisans among many other trip attractions in this ancient land. 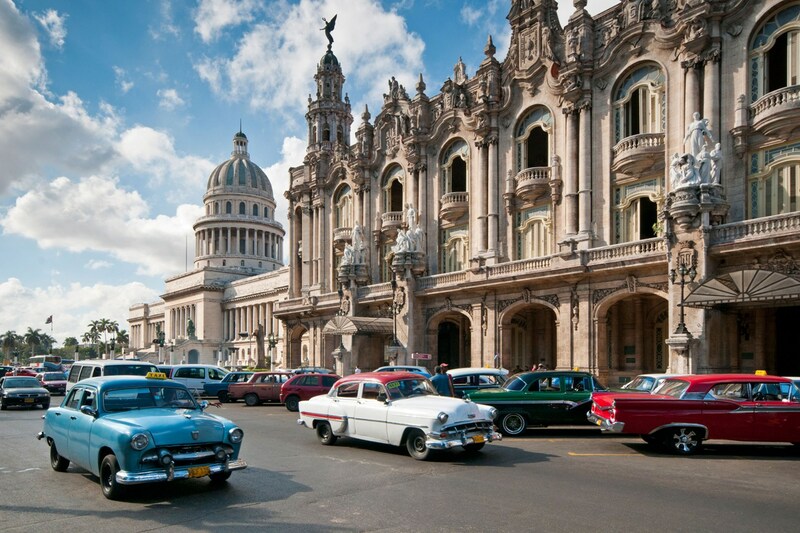 This 14-day trip immerses you in Cuba’s extraordinary culture, history, and social life. 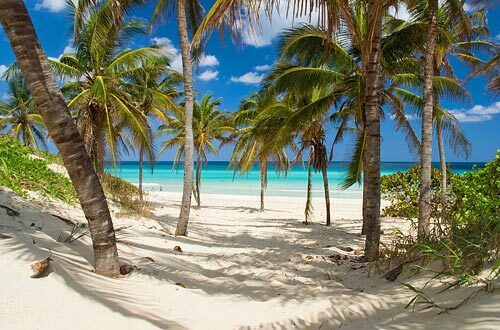 Our itinerary will move us from the cobble-stoned streets of Old Havana to the rich farmlands of tobacco country and the architectural gems of the island’s central provinces. Along our route, we will stay with local families, visit schools and medical facilities, cook Cuban cuisine, spend the day on a farm, dance salsa, walk in Hemingway’s footsteps, and engage with leaders in the fields of history, politics, economics, and the arts, to name but a few activities. 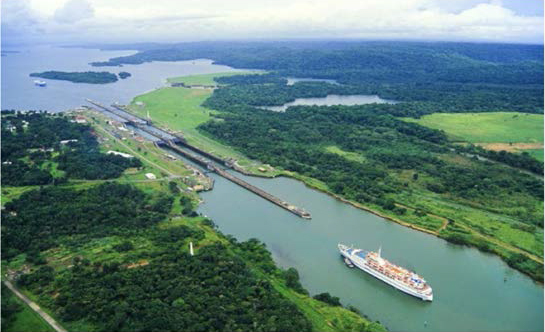 Students will emerge from this trip with a uniquely personal knowledge of one of the world’s most fascinating countries. Study and explore Germany's economic, political, and social environment while visiting the famed cities of Munich, Mainz, Dresden and Nuremberg. Experience a Rhine River Cruise, the UNESCO World Cultural Heritage Site Wurzburg Palace with it's Tiepolo frescoes, the Bamberg Cathedral, the Nuremberg Castle, St. Jakob's Church, BMW World, Dachau Concentration Camp Memorial Site, and Neuschwanstein Castle as part of your Germany Study & Travel course.